"I hope never to see Fletcher Christian again. Unless it is to see him hanged." From Captain Blood to Titanic, movie audiences the world over seem to have a real predilection for nautical dramas. The real-life mutiny of the Bounty has inspired no less than five films. From an acclaim standpoint, the two most notable of the bunch have both been entitled Mutiny on the Bounty. The 1935 version, which starred Clark Gable and Charles Laughton, won the Academy Award® for Best Picture and garnered numerous other nominations. The 1962 release, which featured Marlon Brando, also received a slew of Academy Award® nominations, including one for Best Picture, but no wins. 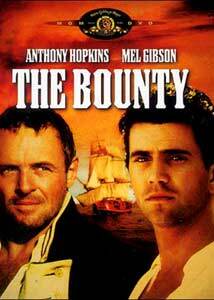 For viewers of a younger generation like myself, the adaptation of greatest familiarity is 1984's The Bounty. While this most recent rendition of the infamous historical incident was ignored by the Academy®, it probably should not have been. On a remarkably sunny and warm December day in 1787, the HMAV Bounty (His Majesty's Armed Vessel: at only 91 feet in length, the Bounty was not considered a "ship") set sail for Tahiti. Its mission was somewhat of a grocery run, to retrieve breadfruit saplings from Tahiti and transport them to Jamaica, where they would be grown to provide food for the slaves of the British West Indies. Commanding was Lieutenant William Bligh (Hopkins), an experienced naval officer who had once served with the famed Captain Cook on a previous expedition to Tahiti. Bligh was determined to make a name for himself with this voyage and planned to circumnavigate the globe by way of Cape Horn in the process. Unfortunately for him and his crew, this aspiration was not to be. After spending over a month in stormy weather attempting to pass around the cape, the Bounty was forced to turn back and go to Tahiti by way of Africa. On the same day that Bligh submitted to the alternate route, he also demoted his First Mate (Day-Lewis) for cowardice and insubordination, replacing him with the Master's Mate, Fletcher Christian (Gibson). Christian and Bligh were friends, but a rift was gradually growing between them on this voyage. They had remarkable different leadership styles, which often caused them to stand at odds with one another. Bligh was a traditional disciplinarian; Christian was far more amiable towards the crew, believing harsh discipline as something to be avoided for morale purposes. Morale would be boosted quite nicely, however, upon their arrival in Tahiti, where the men of the Bounty enjoyed five months of rest, relaxation, and fornication in the tropical paradise, under the hospitality of the local monarch, King Tynah. This vast recreation soon proved to be a serious problem as many of the men started to "go native", shrugging off naval discipline in favor of a hedonistic lifestyle. Christian himself became romantically involved with one of King Tynah's daughters. Some of the men even attempted to desert as the day of their departure grew close, but they were eventually caught and flogged severely for their efforts. Morale had again plummeted once they departed for Jamaica. Morale would sink even lower with the constant castigation of the crew from Bligh. The rift between himself and Christian became enormous with his constant reproof of his First Mate inspired by his perceived lack of professionalism while still on Tahiti. When Bligh announced his intentions of another attempt to pass around Cape Horn and then condemned one of the crew to severe corporal punishment for speaking out against the notion, conditions became absolutely ripe for mutiny. A mere twenty-three days out from Tahiti, Christian himself led at least twelve of the crew in open mutiny, successfully capturing the Bounty and setting the other officers and some of the crew adrift in the vessel's longboat. As is evident from the number of films made from this story, the Bligh/Christian saga is a compelling story. Adapted from the book Captain Bligh and Mister Christian by famed screenwriter/playwright Robert Bolt, The Bounty is considered to be the most historically accurate of the many screen adaptations. From director Roger Donaldson (No Way Out and the upcoming Thirteen Days), this film is a powerful drama and visual treat. On the audio side, The Bounty features moody and beautiful original music from Vangelis. Its greatest asset, however, is not in its script but in its performances. Every actor in this all-star cast, from the stars down to its minor players, does stellar work. Anthony Hopkins and Mel Gibson both deliver flawless, powerful performances in the lead roles. Supporting them are such names as Lawrence Olivier, Edward Fox, Bernard Hill, and Liam Neeson. The Bounty is certainly one of the best dramas to come out of the 1980s, featuring wonderful performances from the entire cast, beautiful photography, and another glorious original score from Vangelis. Fans of taut drama should definitely not miss the chance to see this film. Image Transfer Review: MGM has done a great job breathing new life into this sixteen-year-old print with an anamorphic transfer in the film's original aspect ratio of 2.35:1. Detail is very, very good with solid shadow delineation in the darker scenes. Some minor faults are present, such as faint graininess, slightly muted colors, some small amount of film dirt, and occasional digital shimmer (most notably in an earlier scene when the camera pans across the front of the Royal Admiralty building). However, this is by far the best this film has ever looked on home video. Just for purposes of comparison, I pulled out my old VHS copy and the difference is amazing. Good job, MGM. Audio Transfer Review: The Bounty DVD features a very good Dolby Digital 5.1 remaster. Low frequency extension is very good for a film of this age. Your subwoofer will come alive from Vangelis' terrific original score as well as from some of the weightier storm scenes. Surround channels see heavy use in bolstering the music but somewhat inconsistent use in adding atmospherics. Spatial separation across the front sound stage is first-rate, helping to create a surprisingly enveloping sound even when the surrounds are not being used for atmospherics. The sound mix is a tad heavy, lacking the crispness of more modern films but, overall, this film sounded very, very good and I have no substantial complaints. Extras Review: The only extra is the original theatrical trailer, presented in a 1.85:1 aspect ratio two-channel mono. While virtually "bare bones", this DVD release of a terrific film features an equally terrific image transfer, especially considering the film's age. MGM has done a terrific job with this release.